Many of these materials are rare; some are unique. Although the Research Library does not circulate its materials, we do provide telephone and email service for quick reference questions, and we will be happy to make an appointment with you to discuss your particular research needs. The Strasenburgh Planetarium Library was founded in 1968 with a gift in memory of Rochester entrepreneur Libanus Todd, inventor of the Todd Protectograph Check Writer, a device that saved businesses millions of dollars of loss due to forged checks. The library’s carefully selected collection of basic books and periodicals is used to insure the accuracy of Planetarium programs. 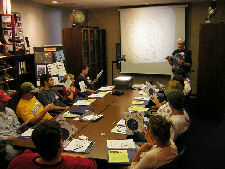 The library also purchases equipment such as star charts, audio-visual equipment and supplies and telescope accessories for use in programs at the Planetarium for school students, teachers and volunteers. The library room is used extensively for teacher and staff training, seminars and meetings. The library is supported by contributions and rental fees.